Passed away peacefully at Lakeridge Health Oshawa on Friday December 7, 2018, at the age of 93. Beloved husband of Joyce for 65 years. 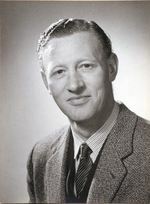 Father of Stewart Bain and Trevor Bain (Mary-Lyn). A special thank-you to the staff on the 6th floor, G and F wing at Lakeridge Health Oshawa for all their care and compassion. A private family service will be held. Arrangements entrusted to Armstrong Funeral Home, 124 King St.E, Oshawa.